I've been enjoying my Android tablet e-reader for a couple of months now ... and it's made me realize some of the shortcomings in FeedMe. So of course I've been making changes along the way -- quite a few of them, from handling multiple output file types (html, plucker, ePub or FictionBook) to smarter handling of start, end and skip patterns to a different format of the output directory. 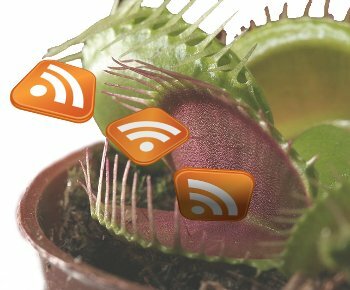 It's been fairly solid for a few weeks now, so it's time to release ... FeedMe 0.7. Eclipse has been driving me batty with all the extra spaces it adds everywhere -- blank lines all have indents on them, and lots of code lines have extra spaces randomly tacked on to the end. I sure wouldn't want to share files like that with coworkers or post them as open source. Enable Perform the selected actions on save. In the Code Organizing tab., enable Remove trailing whitespace for All lines. Review all the other options there, since it will all happen automatically whenever you save -- make sure there isn't anything there you don't want. Review the other options under Save Actions, since these will also happen automatically now. Don't forget to click Apply in the Save Actions preference page. By the way, while you're changing whitespace preferences, you may also want the Insert spaces for tabs preference under General->Editors->Text Editors. An easy way to check whether you've succeeded in exorcising the spaces -- eclipse doesn't show them all, even when you tell it to -- is to :set hlsearch in vim, then search for a space. (Here are some other ways to show spaces in vim.) In emacs, you can M-x set-variable show-trailing-whitespace to true, but that doesn't show spaces on blank lines; for that you might want whitespace.el or similar packages. I had a nice relaxing holiday season. A little too relaxing -- I didn't get much hacking done, and spent more time fighting with things that didn't work than making progress fixing things. But I did spend quite a bit of time with my laptop, currently running Arch Linux, trying to get the fonts to work as well as they do in Ubuntu. I don't have a definite solution yet to my Arch font issues, but all the fiddling with fonts did lead me to realize that I needed an easier way to preview specific fonts in bold. 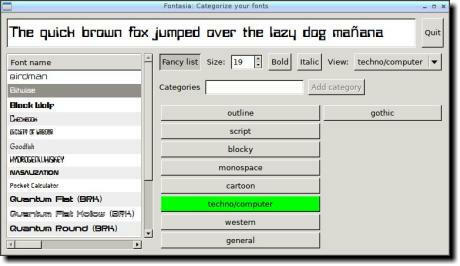 So I added Bold and Italic buttons to fontasia, and called it Fontasia 0.5. I'm finding it quite handy for previewing all my fixed-width fonts while trying to find one emacs can display.